*This is a used FIFA Soccer 2005 game for the Game Boy Advance. It has been tested and works perfectly with little wear on the cartridge. No manuals or original box included, but it ships in a Nintendo DS FIFA 2006 case. EA Sports 2005 entry in their popular FIFA SOCCER series is here, and FIFA SOCCER 2005 contains everything that makes a soccer game great. 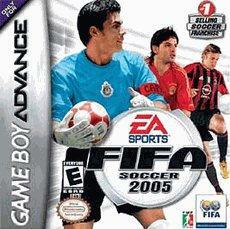 The 2005 installment of FIFA SOCCER adds first-touch skills to the system of great gameplay. Like the previous games, FIFA SOCCER 2005 includes a large amount of teams, players, and extras, including over 350 official team and league licenses. The first-touch skills deal with how a player handles a received ball. With the touch of a button, players with enough skill can effortlessly avoid opponents or pass the ball across the field. Of course, these moves don't always work and depend on timing and setup, keeping the action level high throughout the game. The game also contains a number of game modes. The main mode is career mode, which puts players in control of a team for 15 seasons. Here, players will train their team, recruit new players, and hire staff such as assistant coaches and fitness trainers. While players will begin with a relatively unsuccessful team, a string of victories will lead to a job offer with a more impressive soccer club. Fans of the EA Sports series won't want to miss the 2005 installment in the FIFA SOCCER series. Likewise, fans of other soccer games or soccer fans who have never played a soccer game will enjoy the realistic gameplay and the quick learning curve FIFA SOCCER 2005 presents.